AdvantisV™ leverages high-end base technologies and easily integrated premium options to deliver cost-effective, value-driven productivity in low-margin environments. This versatility, coupled with a robust architecture with minimal maintenance requirements, provides investment protection and a low cost of ownership. AdvantisV incorporates a highly accurate architecture and closed-loop controls for superior yields. It also generates exceptional and consistent output across a range of environments from NPI to volume production. AdvantisV has all the functionality to meet today’s challenges, with a growth path for tomorrow’s. AdvantisV1-30 – Superb for high-mix NPI environments and large board applications. Also a high-volume line booster solution. 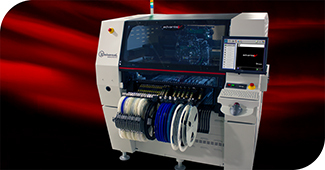 Advantisv2-60 – Flexible, high-speed productivity for medium-volume environments. Also a powerful line booster solution or high-performance small part placer.